Are you tired of always and only slice fruits? No problem! You're one step away from starting the final slicing experience! In a world of chaos populated by monsters and demons, only a ninja with her legendary katana can restore order! 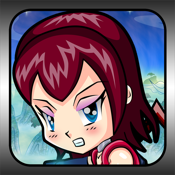 Run, jump and slash with your fingers in this innovative and fast-paced ninja runner game! In the shoes of Ran the kunoichi (a ninja girl) and armed with the legendary Zantetsuken, literally "Iron-Cutting-Sword", you will be able to slice ​​everything in your path, from the most dangerous enemy to the smallest element of the surrounding environment! Nothing will be saved from your bloody rage! Your goal is to reach the end of each level, crossing bamboo forests, rice fields and many other environments, fighting demons of all kinds, dodging traps while trying not to fall from platforms. Absorb the spirits of the fallen to strengthen your bloody sword and look for the bonuses hidden in the environment to increase your strength and agility... and to invoke the help of your mighty beast, the demon tiger! * New gaming experience, slash and run at the same time! * Limitless cutting ability, you can slice everything, even the smallest environment elements! * High quality graphics with spectacular 2.5D effects. * Many bonuses and power-ups to enhance the heroine skills. * GameCenter support with several leaderboards.